Each year, in recognition of important achievements toward the progress of physics, the Physical Society of Japan (JPS) selects a few outstanding papers from the original research articles published in the last ten years in the Journal of the Physical Society of Japan, Progress of Theoretical Physics, Progress of Theoretical and Experimental Physics, and JPS Conference Proceedings. The selection committee has chosen five papers for the 2017 award out of nominations made by the editors of the JPS journals and the representatives of 19 divisions of the JPS. 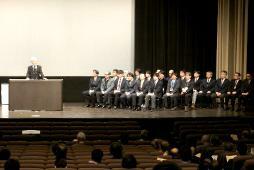 The 2017 award ceremony was held in the morning of March 19, 2017 at Ikeda City Culture Hall (Azalea Hall). The five selected papers together with their citations follow. This is a monumental paper, in which a complete action for an open superstring field theory is written down in a Lorentz covariant form for the first time. The superstring theory is a candidate for an ultimate unified theory, which contains both general relativity and unified theory of elementary particles in a consistent way. However, its precise nonperturbative formulation is not yet available. The string field theory is one of the promising approaches for a nonperturbative formulation of string theory. In fact, it has been successful, for example, in the analyses of classical solutions with tachyon condensation in the bosonic string theory, which does not have supersymmetry. However, the formulation of the superstring field theory, which is supposed to describe the real world, has been a notoriously difficult problem since the 1980s. Although many researchers have tried to construct the action for the superstring field theory, it was constructed only partly in a covariant form, because there were some difficulties in the treatment of the so-called R-sector that describes fermions. In this study, the authors first constructed the action by perturbatively adding interaction terms to the kinetic action, and finally, found a beautiful complete form. The analysis, as well as the results of the perturbative analysis, was rather complicated because the form of the gauge transformation and the interaction terms had to be determined simultaneously in order to not break the gauge invariance. Surprisingly, the authors made a significant leap from the perturbative analysis. They found a complete closed form of the action along with the gauge transformation and succeeded in proving the gauge invariance of the full action. This is really a significant achievement, which can only be reached by experienced and insightful researchers like the authors. Though the paper has been published quite recently, there is no doubt that there will be a lot of progress in the superstring field theory based on this work. It made a breakthrough and created an important new starting point for research related to the superstring field theory. 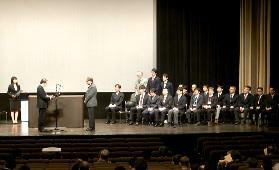 Therefore, we concluded that it deserves the Outstanding Paper Award of the Physical Society of Japan. The baryon-baryon interactions, such as the nuclear force, have complicated characteristics since they work between confined multi-quark systems with white color charge. In order to understand them from the quark level, nuclear physicists have studied the baryon-baryon interactions by including baryons with strange quarks (hyperons such as Λ, Σ, and ≡). However, the interaction between a ≡ hyperon (baryon with two strange quarks) and a nucleon is yet unknown, even whether it is attractive or repulsive, owing to a lack of definite data. Conclusive information on the ≡-nucleon interaction has been long awaited. Previously, some of the authors conducted an experiment at the High Energy Accelerator Research Organization in Japan (KEK) to study strangeness S=−2 nuclear systems produced by nuclear absorption of ≡ hyperons with K beams exposed on nuclear emulsion. At that time, they searched for ≡ absorption events with microscopes around the regions in emulsion, where ≡ hyperons were predicted to be injected using the information from other detectors, but later they noticed that many events had been left unanalyzed. The authors developed a new method to digitize the images of the whole emulsion volume and automatically analyze them. With this method applied to a part of the previously exposed emulsion, they observed one event in which a ≡- hyperon is absorbed by a 14N nucleus in emulsion and then two Λ hypernuclei are emitted. The analysis of this event revealed that ≡- was bound to 14N with the binding energy 1.1-4.4 MeV in the initial state. This energy, being much larger than that of the atomic orbit for ≡- absorption, indicates the existence of a ≡ nucleus bound state due to the strong interaction. Thus, the ≡-nucleon interaction has been confirmed to be attractive. This paper reports an epoch-making result in the study of the baryon-baryon interactions, one of the most important subjects in nuclear physics. In addition, this result has a significant impact on astrophysics since hyperons having an attractive interaction with nucleons are expected to appear inside neutron stars. Hence, we conclude that it deserves the Outstanding Paper Award of the Physical Society of Japan. Among molecular compounds, there are substances called molecular conductors that show high conductivity. Typical quasi-two-dimensional organic semiconductor α-(BEDT-TTF) 2I3, which undergoes a metal-insulator (M-I) transition at 135 K, has been attracting much attention as a candidate for a charge-ordering system, where the inter-site Coulomb interactions between electrons are expected to play an important role. The authors demonstrated the charge ordering in this compound by detecting the charge disproportionation through a single-crystal structure analysis using synchrotron radiation. In this study, they quantitatively determined the charge disproportionation in real space and found the pattern of the charge order to be consistent with that suggested by the mean field theory (a horizontal stripe type of charge ordering). Furthermore, they determined the molecular arrangement precisely and estimated the overlap integrals between molecular orbitals, which rationalized the nonmagnetic state observed in the charge-ordered phase. This paper has become a standard reference in the research evaluating the charge ordering in molecular conductors by synchrotron radiation. The results of this research give the basic knowledge on the research of charge-order-related electronic properties such as nonlinear conductivity. Furthermore, this work boosts the studies on novel dielectric properties and optical functionalities such as electron-type dielectrics in charge-ordered insulators, high-speed melting of charge order by femtosecond optical pulses, and high-speed control of ferroelectric polarization by electric field pulses. This study experimentally elucidated charge ordering predicted theoretically and provided the basis for further development of this research field. Hence, we conclude that it deserves the Outstanding Paper Award of the Physical Society of Japan. Spin ice has attracted much interest since the late 90s both experimentally and theoretically because it is a magnetic analogue of solid water, whose protons are disordered even at zero temperature and have a highly degenerate ground state as suggested by Pauling. Nowadays, spin ice has become one of the important areas in the field of highly frustrated magnetism. This paper has made a significant impact on the field by observing exotic excitations, which are theoretically proposed to be regarded as magnetic monopoles in the spin ice system. In order to observe magnetic monopoles proposed theoretically, the authors prepared a high-quality Dy2Ti2O7 single crystal and made a precise low-temperature specific heat and neutron scattering measurements in the kagome ice state, which was realized by applying a small magnetic field along  direction. The Arrhenius law is clearly seen in the low-temperature specific heat result, indicating that monopole-antimonopole pairs are thermally activated from the ground state. The obtained creation energy of 3.5 K in the result reasonably agrees with the estimated value. Moreover, the authors showed clearly the diffuse scattering of magnetic monopole, which is consistent with the results of Monte Carlo simulations, under the appropriate temperature and field near the critical point. In summary, this study has shown not only the existence of theoretically proposed magnetic monopoles in the kagome ice state using a combination of precise experiments and simulations, but also suggested the importance of the low-temperature quantum effect. Therefore, this paper has also have a significant influence on the recently expanding experimental and theoretical studies of quantum spin ice and quantum spin liquid. Hence, we conclude that this paper deserves the Outstanding Paper Award of the Physical Society of Japan. This paper reports the discovery of novel superconductor LaO1-xFxBiS2. It is known that most of high-temperature superconductors, such as cuprates and iron-based superconductors, have layered structures, in which a conduction layer (CuO2 or FeAs layer) and a blocking layer are alternatingly stacked. For a fixed conduction layer, for example a CuO2 layer, there are various superconducting materials with different blocking layers. Their superconducting transition temperatures are different for different blocking layers. Therefore, a usual way for searching for new superconductors is to search for a new blocking layer. In contrast, the authors challenged to search for a new conduction layer and succeeded in finding another key element Bi, which forms BiS2 layers. Triggered by their discovery, many research groups in the world entered the research field of layered BiS2 based superconductors. Nowadays, this research field is very active and has established its position in condensed matter physics, which must be a big contribution of the authors of the present paper. In this study, a new superconductor was designed well along with a concrete policy, for example, to stack alternatingly the conducting BiS2 layer and the blocking LaO layer, to dope the carriers from the blocking layers by substituting O with F, etc. All the experimental data including the precise structure analysis by X-rays, electrical resistivity, and magnetic susceptibility indicate a high quality of the synthesized samples, giving the evidence for bulk superconductivity. This is the first published paper on layered BiS2-based superconductors in the world, and thus was cited by many authors (about 200 citations so far). By all these facts, this paper deserves the Outstanding Paper Award of the Physical Society of Japan.